This Canon EF Mount Samyang 8mm T3.8 UMC Fish-Eye CS II Lens is a fish-eye cine lens designed for video capture on cameras with APS-C sized sensors. It features an 8mm focal length and a 180° ultra wide angle of view. This angle of view changes, however, to 167° on Canon cameras because Canon APS-C sized sensors are slightly smaller and have a crop factor of 1.6. Fish-eye lenses aren't for common, everyday shots, but can be excellent for capturing sports stadiums, large halls, highly-packed city sights, and similar scenery in a warped, unconventional fashion. They're also useful in making small rooms look bigger and straight lines or bars appear more oval, in both scenarios as a result of warping the image. The aperture ranges from T3.8 to T22. T3.8 being its fastest aperture, this lens is best used in environments with sufficient light or with a light source incorporated. The aperture is manually adjustable without click stops with a continuous, smooth aperture ring. Both the aperture ring and focus ring feature a 0.8 gear pitch in case you want to use a follow focus with either. The focus ring is also well-damped and very smooth. The lens doesn't offer auto-focus, but in fish-eye lenses objects appear mostly in focus anyway. The minimum focusing distance is 11.8" (30 cm). The lens has 10 lens elements arranged in 7 groups. It's coated with Samyang's multi-layered, anti-reflection Ultra Multi Coating (UMC), which suppresses flaring and ghosting. The lens body is made of aluminum and is very robust. 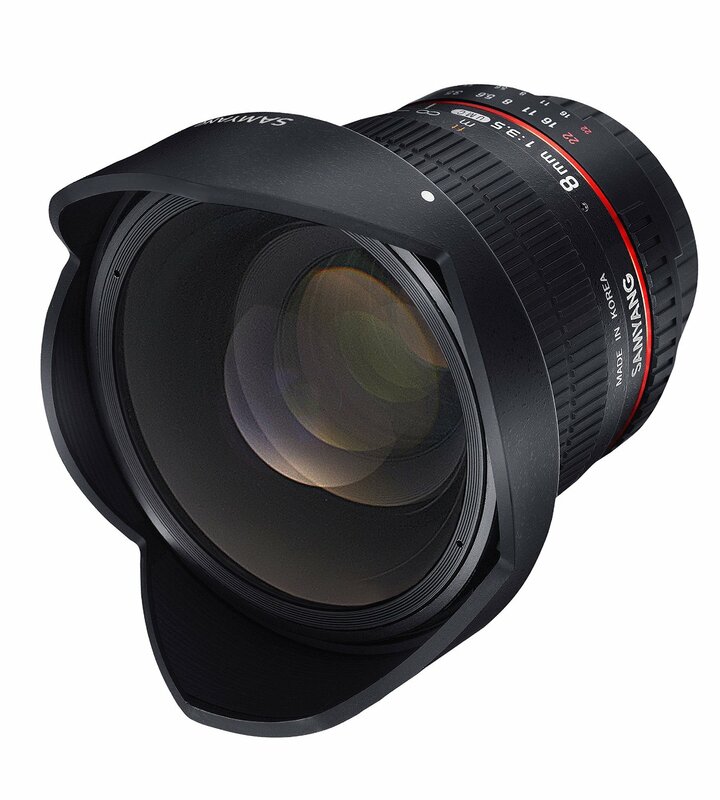 A removable, petal type lens hood, and front and rear lens caps are included with the lens. Box Dimensions (LxWxH): 8.7 x 6.5 x 4.9"